If I wasn’t doing this I’d be an: actor, singer, dancer. Most impressive person I’ve ever met was: HRH Prince Charles. I unwind by: listening to classical music and reading a good book. On my desk right now is: a lot of paperwork, LOL. My favorite IAVM conference I ever attended was: PAMC. It always ROCKS. If I were on the other side of the stage I’d be an: actor, singer, dancer. One trait an up-and-coming venue manager should have is: patience. One up-and-coming venue star in the industry is: Jenny Pollock. One of my goals for this year is to: retire on Dec. 31, 2015, YES! How do you plan to help elevate the profession? Continue to be a mentor. Where do you see new growth opportunities in the profession? Small and mid-size communities and the development of outdoor festivals. How do you stay current with industry trends and developments? Through social media and IAVM. Who are three people you’d invite to a dinner party and why? Pope Francis for his commitment to humankind; Harry Connick, Jr., for his commitment to his profession and music education and to our hometown – New Orleans; and Stephen Sondheim for his brilliant musical compositions for the American Broadway stage. 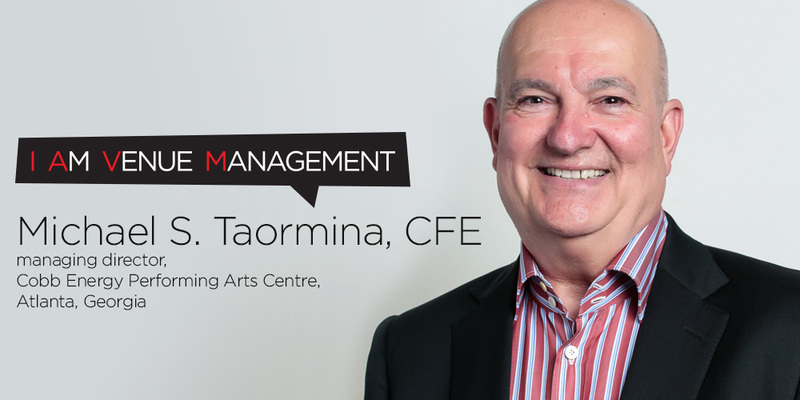 Michael S. Taormina, CFE, is managing director of the Cobb Energy Performing Arts Centre in Atlanta, Georgia.